Sunday 4th March saw the club’s first event of the 2018 calendar take place — a skills seminar at Alexandra Palace. 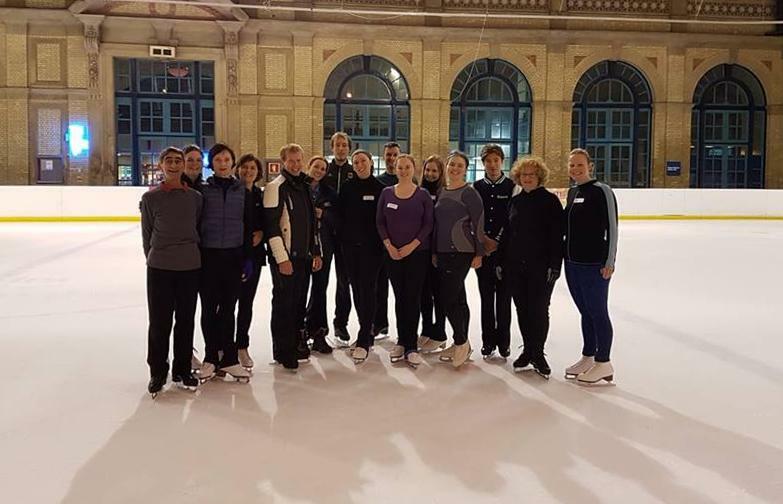 The club were fortunate to have Alexandra Palace’s head coach Gary Jones and 2x German Champion Franz Streubel leading the class. With 17 skaters of all levels, it was great to see everyone improving their skills as the seminar went on. The seminar kicked off with Franz leading the skaters in a series of warm up exercises. According to Gary, when the majority of skaters get on, the first thing they do is to skate round without any real warm up in mind. These exercises are designed to get the muscles working. The first exercise was a side to side transfer of weight designed to warm up the quadriceps. The following exercise was lemons but using the arms, swinging them forward when the feet came back together. These were swiftly followed by backwards lemons. This exercise is designed to loosen the shoulders and arms. Skaters then progressed onto a forward crossover exercise. The intention was to show the skaters that they have two pushes on a crossover and which is the most effective push to choose. This will help skaters to have a stronger crossover and push. The key in this exercise is to bend the knee. Russians, cross rolls, slaloms, and side to side knee lunges all followed. Particular attention was paid in getting the skaters to hold deeper edges and to focus on less scratching with their blades. An outside loop exercise challenged the skaters and was rewarded by shouts of “Yes!” when someone achieved the difficult task. Next up the skaters practised their twizzles. Split into 4 lines each row took it turn to twizzle across the pad. Taryn had an excellent twizzle. Gary and Franz demonstrated a 3 turn exercise designed to help the skaters with their twizzles. Newcomer Randal demonstrated holding an excellent edge on his back 3 turns. After a short break, the seminar resumed with running and stopping on the ice at different intervals, again skaters were split into 4 lines as they took turns to race across the ice. The focus turned to alternating drags down the pad with a focus on making sure the back knee was touching the ice. Moving onto spirals, Sara, Yana and Taryn all had beautiful lines and lovely high extensions. However, Franz was not happy with seeing spirals being executed with bent legs and so all skaters were made to execute their spirals again. Spirals were quickly followed by spreads. The key advice was to bend those knees and turn those feet out. The skaters moved onto spins and jumps next. Working from upright spins to camel spins and ending with sit spins the skaters found a spot to practise the tips given to them by Franz. Going on to jumps, skaters started with salchows and progressed up to Loop jumps. The last section of the seminar was dedicated to ice dance. Gary demonstrated the Prelim Foxtrot and skaters then followed Gary either doing solo dance or coupled up with the few men in attendance. They also had a go at the Rhythm Blues as the last dance of the session. It was great to see lots of new skaters taking part in their first club event and to see a wide range of skill and from different disciplines. All the skaters had a great afternoon as evidenced by the laughter and joking that took place. The club thanks Gary and Franz for being willing and available to teach the seminar. The next club event will be Sunday 29th April at Lee Valley for our Spring Skills competition. Please do check our website and Facebook pages for more information.